Push him onto your aerial making it easier to spot your car in the car park. Size: 6cm across x 8cm high. Made of: High density foam. This grim reaper is perfect for Halloween and is looking forward to scaring people. Wasn’t planning on buying anything for myself but couldn’t resist this. Looks great on my mini. Delivery was fast and I was kept informed of the progress of the order. Would definitely recommend the product and the site. Thanks for your lovely feedback. We love the moustache idea...when the dollar/pound rate improves we'll see what we can do! Jenny. 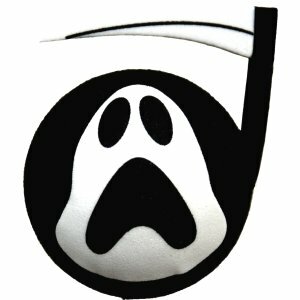 The Grim Reaper aerial topper is just what I wanted. I fits very snugly onto the tip of our aerial (car is a Skoda Yeti) and does not affect radio reception at all. The product seems well put together and I imagine it will last us a good while.